or, click here to access the guide without providing your details. Have you reached a stalemate in your walk with God? Do you feel the need for growth? It IS possible to find the way through all the religious ideas and jargon and discover more about God and His ways, and so implement life-changing authentic Christian virtues. This free insightful booklet will help you examine the Bible's teaching on conversion. The process begins with God's calling, followed by the key steps of repentance, baptism and the receiving of the Holy Spirit—finally climaxing with the return of Jesus Christ, when the dead in Christ are resurrected to immortality and given eternal life. Our ultimate transformation is to be changed from a mortal to an immortal being! 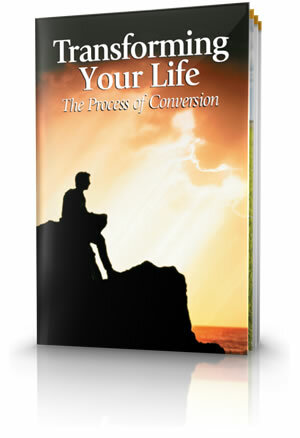 What exactly is conversion? 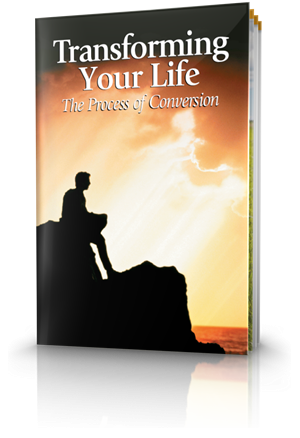 People talk of their "conversion" or of being "converted," but what does that mean? We know from the definition of the word that it means a change, but a change from what to what? You need to know! Who Are God's True Followers? Millions of people claim to be Christian—followers of Jesus Christ. Yet beliefs, practices and lifestyles differ greatly. Jesus said His true followers are "called, chosen and faithful." How can we discern true discipleship of Christ? Not long after Christ's death, the apostle Peter delivered a powerful message about salvation through Jesus Christ. Cut to their hearts, his audience responded, "What shall we do?" Indeed, what must we do to be saved? Responding to God involves not just repenting of our individual sinful acts. It also involves a recognition that our hearts and minds have been corrupted by the world and the devil, "the prince of the power of the air" (Ephesians 2:2). A change in the way you think is the most important aspect of real repentance and being a true Christian. A vital first step to becoming a true servant of God is to admit that we are sinners and to seek God's forgiveness and help to avoid sin. But what exactly is sin? We need to understand what God's Word says about sin and why we sin. When God formed our first human parents Adam and Eve in the Garden of Eden, they were part of a created order that was "very good" (Genesis 1:31). Clearly they were not bent on evil. What's So Bad About Sin? One of the fundamental principles of the Bible helps us understand why God wants us to quit sinning and turn to Him. That basic principle is we reap what we sow! Must We Obey God's Commandments? Jesus explicitly shows that our obedience to God must include obeying the Ten Commandments. Why should a Christian seek to be baptised? How should one be baptised, and by whom? What does baptism symbolise? All these are key questions, because baptism is a crucially key step we must take if we are to be truly converted. What is the correct method of baptism—sprinkling, pouring, immersion or some other technique? Baptism represents the most important commitment we can make. It signifies our willingness to surrender our lives fully and completely to our Creator—putting to death our old self and rising from a watery grave to live a new and transformed life. None of us can overcome our sins and shortcomings without God's help. And God makes that help available to us through His Holy Spirit. But what exactly is that Spirit? How does it help us to change? And how do we receive it? Why Can't Theologians Explain the Trinity Doctrine? Many people assume that the Holy Spirit, along with God the Father and Jesus Christ the Son, form what is commonly known as the Trinity. The doctrine of the Trinity expresses a belief in one God who exists in three distinct but equal persons. Is the Holy Spirit truly a third divine person, along with the Father and Jesus? The Scriptures speak of the Holy Spirit in many ways that demonstrate that it is not a divine person. The key to solving the problem of sin in our lives is the help we receive through Jesus Christ. Many people believe God will accept them just as they are. But Scripture nowhere supports this idea. God expects His true followers to grow, mature and bear fruit. What kind of fruit does God expect? And how do we produce it? Paul scolded the Corinthian Christians for their unspiritual attitudes and conduct (1 Corinthians 3:1-4). He explained that their problems were caused partly by some of them having too little knowledge of God's ways. He wrote: "Awake to righteousness, and do not sin; for some do not have the knowledge of God. I speak this to your shame" (1 Corinthians 15:34). The apostle Paul admonished members in one of the churches he started, "Do not quench the Spirit" (1 Thessalonians 5:19). He also urged the young evangelist Timothy: "Stir up [rekindle] the gift of God which is in you through the laying on of my hands. For God has not given us a spirit of fear, but of power and of love and of a sound mind" (2 Timothy 1:6-7). God is aware of everything we say and do. Not even a sparrow can fall to the ground without His knowing it (Matthew 10:29 Are not two sparrows sold for a farthing? and one of them shall not fall on the ground without your Father.). Therefore when anyone prays to God He is well aware of the words that are spoken. But does He really consider all the requests that are directed to Him? Repentance from dead works and faith toward God are listed in Hebrews 6:1 as part of the foundation that ultimately leads to perfection and eternal life. Jesus Christ set an important pattern in His preaching when He regularly called on hearers to "repent, and believe" (Mark 1:15). The apostle Paul also preached "repentance toward God and faith toward our Lord Jesus Christ" (Acts 20:21). In Ephesians 2:8-9 Paul explains that "by grace you have been saved through faith, and that not of yourselves; it is the gift of God, not of works, lest anyone should boast." How is God One? Is God a Trinity? Who was Jesus of Nazareth? Was He a mere man, or much more? What was the significance of His death and resurrection? In this booklet you'll learn more about the nature of God and Jesus Christ and our future destiny with them as revealed in the Bible.